At our house, soup has been a big part of the new fall season arriving. We often make a big crock pot of soup for dinner and eat the leftovers for lunch the next day. Many times, I make my whole wheat cornbread to go with it, but the gluten- and dairy-free kids we care for each week need an alternative. 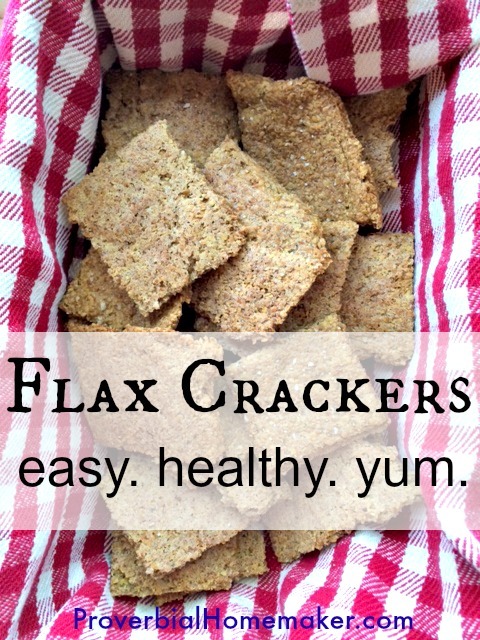 These flax crackers (adapted from a recipe at Clean, Green, Simple) are a perfect allergy-friendly snack or side for soups. They are so tasty and healthy, the rest of us eat them freely as well! Combine flax meal, water, and 1-2 tsp garlic salt in a medium bowl. If the dough is too wet, add a bit more flax meal until it is thick and spreadable. Spread onto a baking sheet lined with parchment paper. ⅛ inch is more like a cracker, while thicker gives you tasty toasts. Either way is excellent. Gently cut the dough into squares, scoring it for easy breaking after dried. Sprinkle with garlic salt and ground rosemary, to taste. Bake for 20-25 minutes until just beginning to brown. Let cool completely, then break into scored squares. Store crackers at room temperature, lightly covered. Looking for more gluten-free recipe ideas? Try my GF Pinterest board! Follow Tauna Meyer (ProverbialHomemaker.com)’s board Gluten-Free Recipes on Pinterest.